Research from IHS Markit shows that Europe is one of the most digitised regions in the world, and the firm expects this trend to continue. Analogue shipments declined by a record-breaking 45 per cent from 2014 to 2015 as Europe migrated to digital. IHS projects that Germany will be one of the most digitised regions in the world, predicting that 99 per cent of the country’s users will be digital by 2020. TETRA has historically been the digital technology with the greatest uptake in Europe. It has the largest installed base; at the end of 2015 the region had more than half of the world’s active TETRA users, according to IHS data. The European TETRA market is buoyant, with ongoing activity in many countries. As well as the new implementation in Germany, the C2000 TETRA network in The Netherlands is being renewed for the Ministerie van Veiligheid en Justitie (Ministry of Security and Justice). C2000 is the communications system for all emergency services in the Netherlands, and one of Europe’s first nationwide TETRA systems. The renewal, planned for completion this year, will see a new TETRA network implemented to support more than 70,000 users. Although broadband applications are increasingly utilised by critical users, we are seeing a significant uptick in the use of TETRA for data. This is due to the active development of relevant applications and solutions, driven by users wanting to make efficiency and performance improvements and maximise their investment in TETRA networks. Given that TETRA is a narrowband technology, developing data applications for TETRA might not seem the most obvious route. However, many of the operational benefits require relatively small amounts of data to be exchanged. The TETRA system over which the data is transmitted is secure, available and accessible. Operators have a trusted tool in their TETRA network, and want to make the most of it. For example, working with external sensors TETRA has seen increasing deployment as a telemetry, telecontrol and supervisory control and data acquisition (SCADA) solution where availability and security are key requirements. 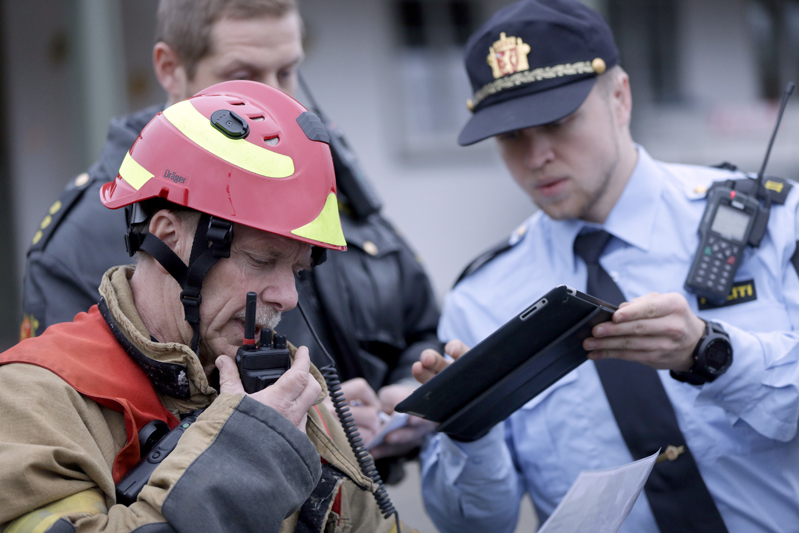 The resilience, availability and security of TETRA coupled with its efficient use of spectrum will continue to make it an attractive bearer for critical voice and dedicated data solutions. The ongoing development of additional functionality within TETRA terminals will be important for existing TETRA users and new ones alike. In this latter category, the opportunities presented by smart metering and smart cities may be significant. Applications using TETRA along with other bearers are already in use and it is likely that hybrid solutions will be increasingly common. With the ubiquity of broadband services for the consumer and business worlds, public safety organisations are looking for similar in their professional communications – in particular high-speed data capabilities that will enable applications that cannot be supported by narrowband technologies. When opting to add broadband capabilities the key priority is to ensure that existing services will continue without reduced service levels. With this approach an organisation can keep using a narrowband network for mission-critical voice and messaging and introduce mobile broadband services step by step. There is growing interest in the hybrid network model, with a number of trials conducted. A successful example is run by Airbus Defence and Space and RIKS (a national TETRA operator) in Estonia, which tested the capabilities of a smartphone application with critical users. The UK represents a unique approach; LTE is expected to be phased in from 2017 through to 2020 as the bearer for the Emergency Services Network (ESN). It will ultimately replace the Airwave TETRA network. However, although LTE technology provides the broadband bearer and enables a range of applications the service requires additional functionality to address the specific security and availability needed by critical communications users. Collaborating with other key stakeholders around the world, the TCCA has led initiatives with standards bodies ETSI and 3GPP to define and standardise the necessary features and capabilities in LTE. 3GPP Working Group SA6 was formed specifically to address the requirements for critical broadband mobile communications. Work is ongoing to incorporate the necessary features within the LTE standards to deliver a commonly supported global LTE standard that can properly host mission-critical communications in the future. Although mission-critical broadband is garnering a lot of focus IHS research shows that TETRA is predicted to remain the technology of choice for public safety and security (PSS), and is projected to continue to expand its installed user base as PSS subscribers across Europe undergo mid-life upgrades to extend the life of TETRA networks. And as we can see from the decision in Germany this will be to at least 2030. Knut Baltzersen, acting head of department for technology at the Directorate for Emergency Communication (DNK), explains how Nødnett came to be. The decision to build Nødnett, a nationwide TETRA network, was made by the Norwegian parliament. Before Nødnett the police, health, and fire services had a plethora of different networks of varying degrees of security, coverage, capacity and functionality. Many were long overdue for replacement. This, combined with how Nødnett makes it easier to co-operate across regional and organisational borders, were the factors driving the decision. User organisations were involved from the beginning by participating in creating a common set of specifications for the new network. During the build the emergency services established their own projects both centrally and regionally. These included user acceptance and testing of the network. DNK is continuously looking for ways to utilise Nødnett’s full potential, such as for data applications – the use of Nødnett for M2M and SCADA are examples of this. DNK expects that Nødnett will be used for critical voice communication for the next 10 to 15 years. PPDR organisations can use commercial technologies such as 4G/LTE in parallel. It will therefore be increasingly important that PPDR users can be offered LTE-based communication solutions that meet their needs for enhanced resilience and security. The requirement for secure and reliable communications will never go away, and future deployments must consider new threats. Voice will always be the most critical form of communication, but future deployments must also provide mechanisms for secure and reliable data comms. Phil Kidner is the CEO of the TCCA. Thanks to TCCA members Airbus Defence and Space, DNK Norway, Hytera, IHS Markit, Motorola Solutions and Sepura for contributions to this article.